Liverpool and France striker Djibril Cisse may move from the club in January if manager Rafael Benitez does not start him more regularly. 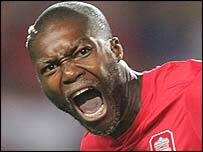 Cisse, 24, has made just two starts in the Premiership this season. And he said: "I accept Rafa Benitez's decisions and I'm patient. But I'm not going to stay on the bench all season. "At the moment it is only the start of the season but if the situation does not change, my thinking will be different in December." Cisse was linked with a move to French club Marseille in order to pave the way for Liverpool to sign Michael Owen, who instead ended up joining Newcastle. The Frenchman has also been played out of position on the right of midfield by Benitez and could seek a move away from Anfield to improve his World Cup prospects. He added: "I'm know it's selfish but I have to think about my own career. There's a World Cup which is coming and I want to be part of it." Benitez currently prefers to start with Peter Crouch on his own up front and has also been strongly linked with signing Portuguese forward Simao Sabrosa in the January transfer window. Cisse is the Reds' £14m record signing and the deal to bring him to the club was done under former manager Gerard Houllier.